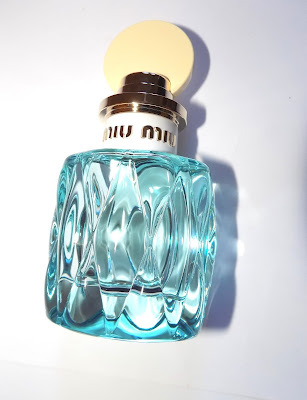 L'Eau Bleue is a dewy , green floral. It has a slightly unisex feel at first and a citrus burst that leads to lots of the pretty white floral of lily of the valley . The citrus and lily stay as the scent progresses. There are green notes, possibly the lily stem, that adding a coolness and rose hovers very lightly in the background adding softness. I like this new version better than the original which just wasn't to my taste. It was too sharp at times where L'Eau Bleue is not. This is more floral and that appeals to me along with the generous lily notes, a scent I really like. 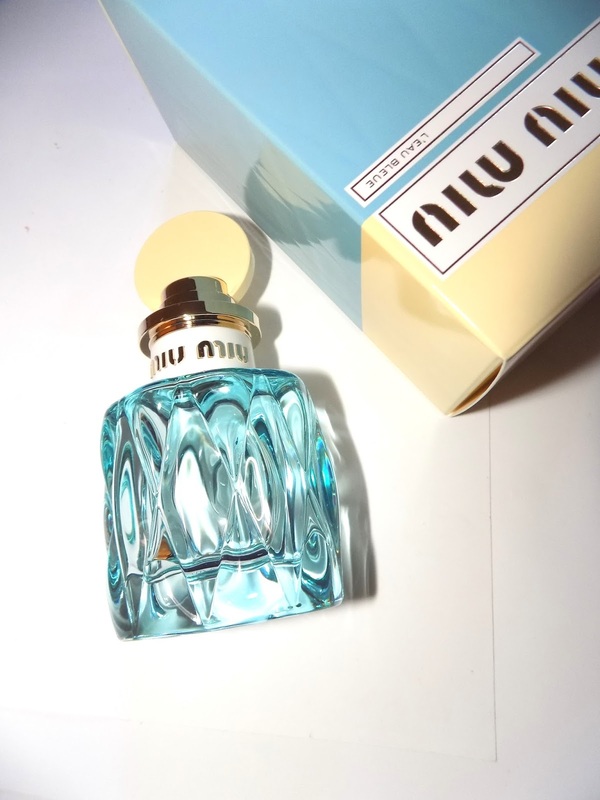 One of the other notes- akigalawood is a molecule developed by perfumers Givaudan and it is said to smell like a blend of patchouli, peppery notes and oud. I don't get much of any of those, some pepper but mostly these deeper notes stay hidden. As it dries down, it becomes more quiet and wears closer to the skin where you get soft wafts of lily, and the barest woods. L'Eau Bleue is a great warm weather scent and just in time for Spring as it's very airy , cool, fresh and bright. Miu Miu L'Eau Bleue is available at Sephora, Macy's and other department stores. 1oz is $ 68, 1.7 oz is $ 90 , 10 ml rollerball is $ 28 . It's great to see more organic brands being stocked in drugstores and places like Target. For many years they were hard to find . 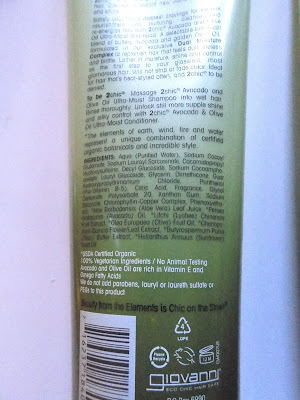 The first time I used a Giovanni product was pre- blog and I think I got it from the Vitamin Shoppe mail order. Skip forward a decade and now Giovanni's new line, 2 Chic, is being carried at Walgreens at a price point to compete with many other brands on those shelves. There are three shamp/cond combos available in the 2 Chic line. Ultra Moist was my pick. 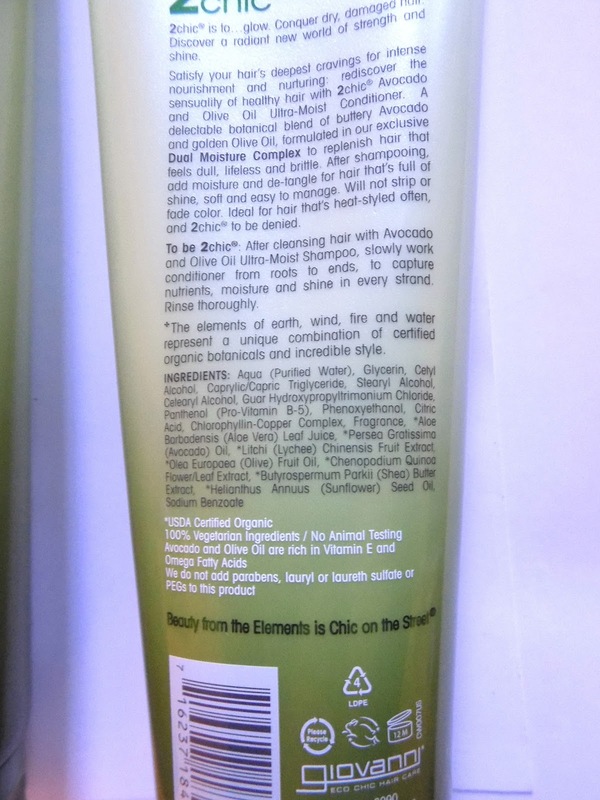 This duo contains avocado and olive oils to add moisture along with panthenol aloe and shea butter. This duo definitely amps up the moisture for drier hair. All those heavy hitters don't weigh down hair though. 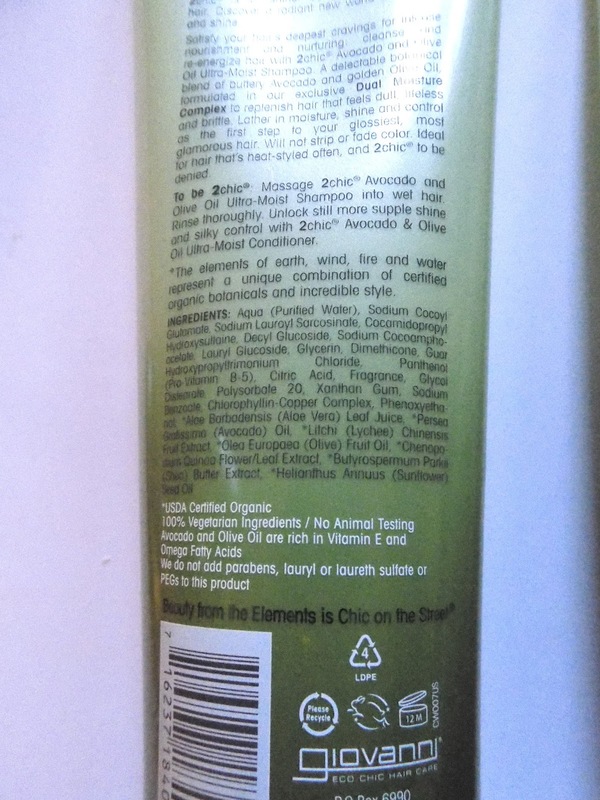 After using not only was my hair soft and shiny it was full, had volume , movement and styled well. I still used my usual leave in on the driest end areas and a touch of oil (but much less than I had been using) after drying on some ends. 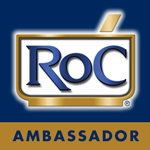 All the 2 Chic products are paraben-free, Leaping Bunny certified, 100% certified vegetarian and made in the USA. You can also pick up 2 Chic in Repairing or Ultra Sleek . 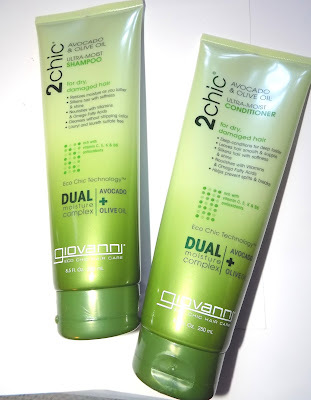 Giovanni 2 Chic Ultra-Moist Shampoo & Conditioner are $ 7.99 each at Walgreens. 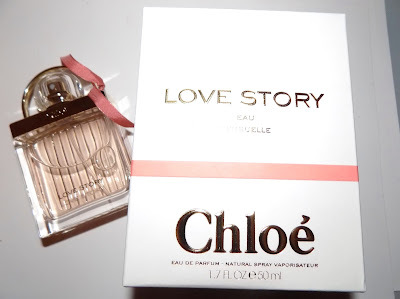 Chloe Love Story Eau Sensuelle is the next in the Chloe Love Story fragrance collection. Love Story Eau Sensuelle starts with a burst of fruit , dewy florals and a little clean soap. Orange Blossom is still the main flower here as it has been with previous versions but not as prominent . While lemon, yuzu and nashi (pear) are listed as top notes, I only get a very quick impression of the citrus and it's gone. The Yuzu and nashi hang around a bit longer but this does not stay overly fruity at all. As it begins to dry, the heliotrope comes in and then the sandalwood for grounding. It's a very soft fragrance and by the drydown when the sandalwood is at full presence, a touch powdery . 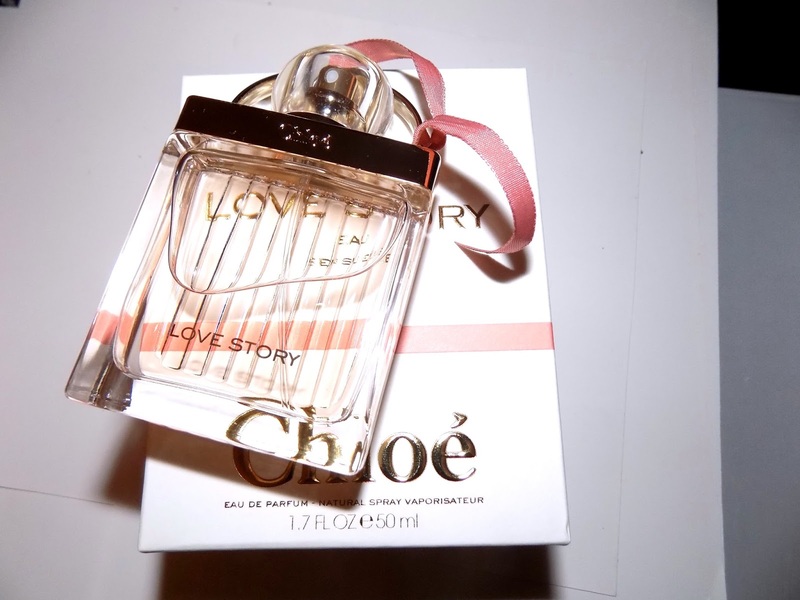 The overall impression is a clean , lightly floral fragrance. Sunny, easy to wear and feminine . The sillage here is light to medium, it's not a skin scent, it does project some but at the same time it's not strong and wears softly on skin. 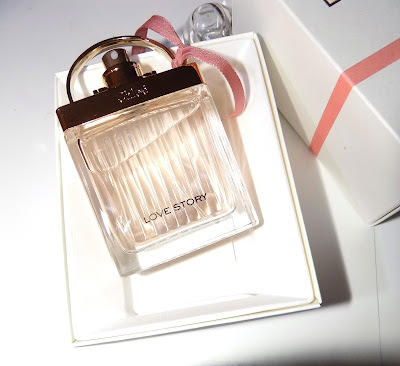 The bottle continues the brand's tribute to the locks placed by lovers on the bridges of Paris with a blush colored juice and ribbon this time. 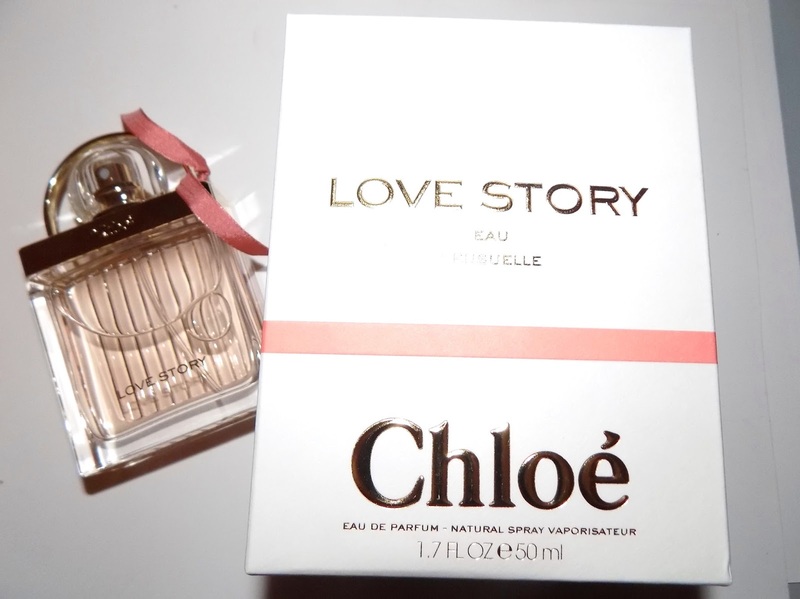 Chloe Love Story Eau Sensuelle is $ 105 for 1.7 oz , 1.0 oz $ 75 and 2.5 oz $ 132. L'Occitane Solidarity Soap is back. Each year the brand does one of their fabulous moisturzing shea soaps especially for charity . 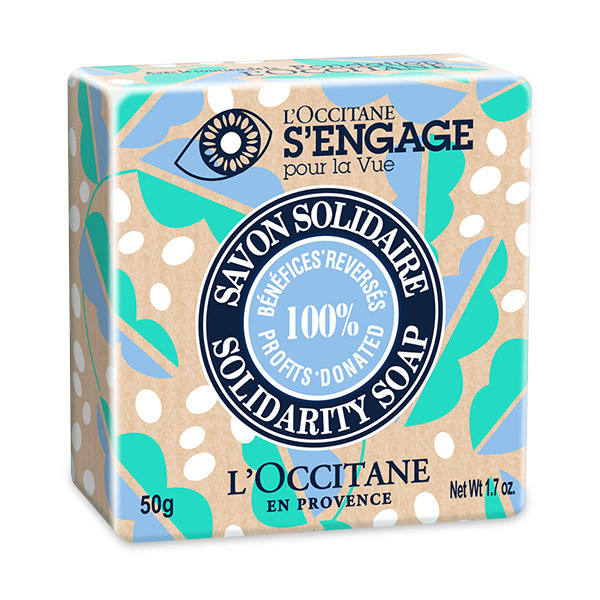 Each 1.7 oz soap is just $3.00 and 100% percent of the profits from the sale of the soap goes to helping fight avoidable blindness by funding NGOs projects for eye care, with the support of the L'Occitane Foundation. Narciso Rodriguez Fleur Musc is the newest addition to the designer's line of fragrances. This time it's in a vivid pink bottle that references the flowers within. Fleur Musc is a light floral , more floral than Rodriguez usually does. The musk we've come to expect from the line is there but this time the floral notes take the lead. Rose and peony are at the front and stay all the way with patchouli and amber mixing in strongest at the midpoint. The rose here is a lovely dewy rose, not cloying, heavy or powdery but very modern and pretty. 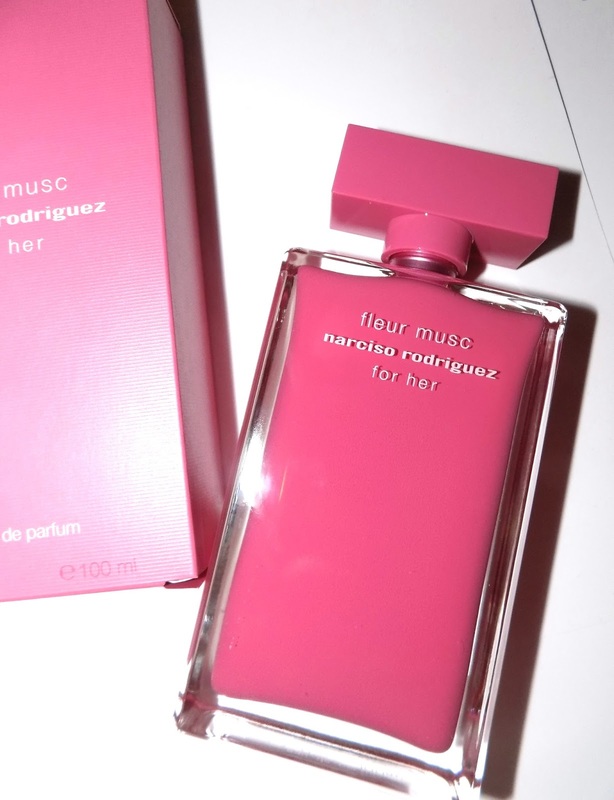 Mixed with the peony it makes Fleur Musc a soft, fresh floral. It is at times a bit sharp, especially at the beginning, but as it dries down that goes away. While this is not quite a skinscent , it has more presence than that, it does stay fairly close to the skin with light sillage. Feminine and Spring like it can be worn anytime , any day and will definitely help shake off those upcoming April showers. 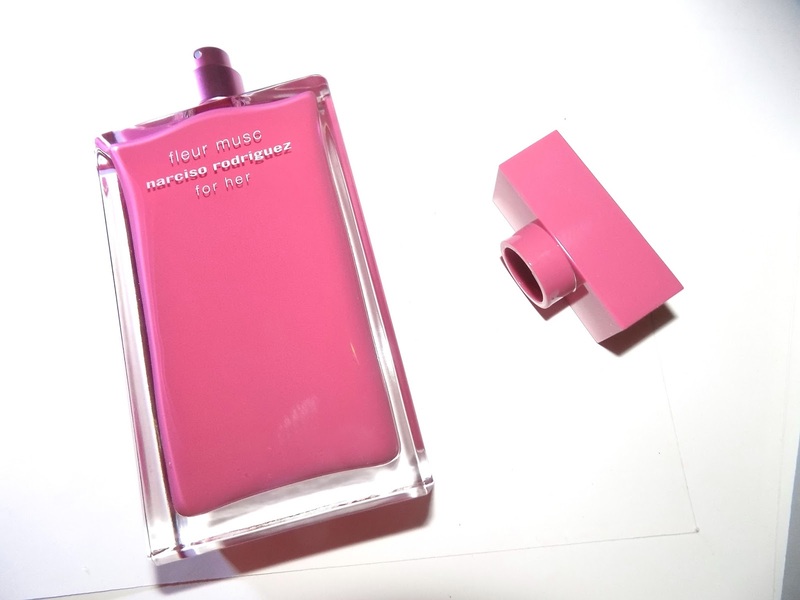 Narciso Rodriguez Fleur Musc is $100 for 1.6 oz and $ 124 for 3.3 oz and will available at department stores (@ Macy's now). Lip oils have been popular for awhile and they’re still going strong thankfully. This time of year I can't get enough . 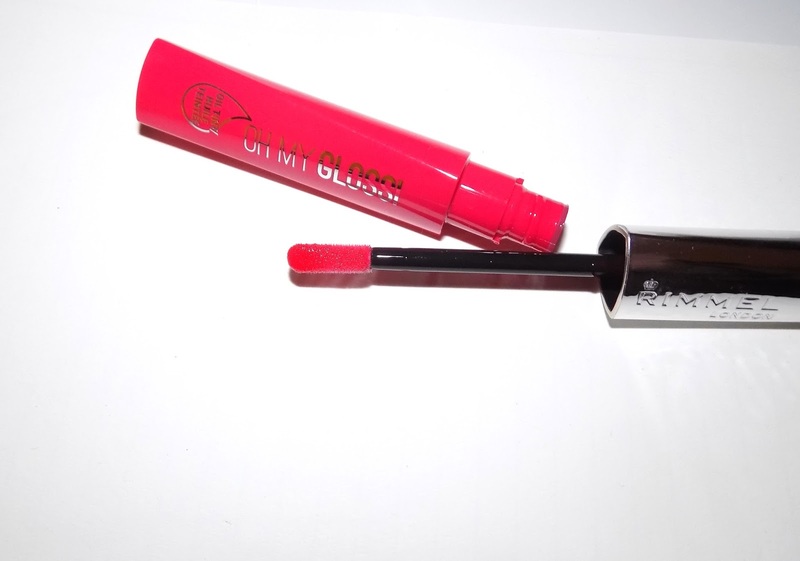 New from Rimmel is Oh My Gloss Oil Tint. As the names says these are a gloss and have a good bit of shine along with a bright pop of sheer color. The gloss settles down fairly quick leaving more of a sheen than full on gloss and once they wear off you still have a stain left . 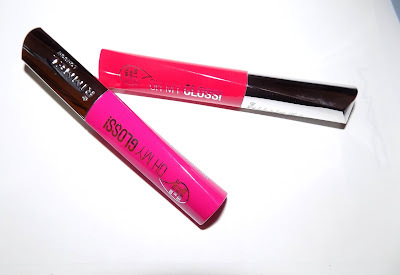 They are also an oil tint and packed with moisture for lips. There are four precious oils in them per Rimmel, including argan and they do feel great on lips. They are not greasy, heavy or tacky. I love them and am using mine on bare lips and over more matte lipsticks for a boost since my lips are pretty dry right now. They work well both ways and I am already thinking I might need more colors. Scent wise they do have a strong fruity scent. I like it but keep that in mind if you're fragrance averse . 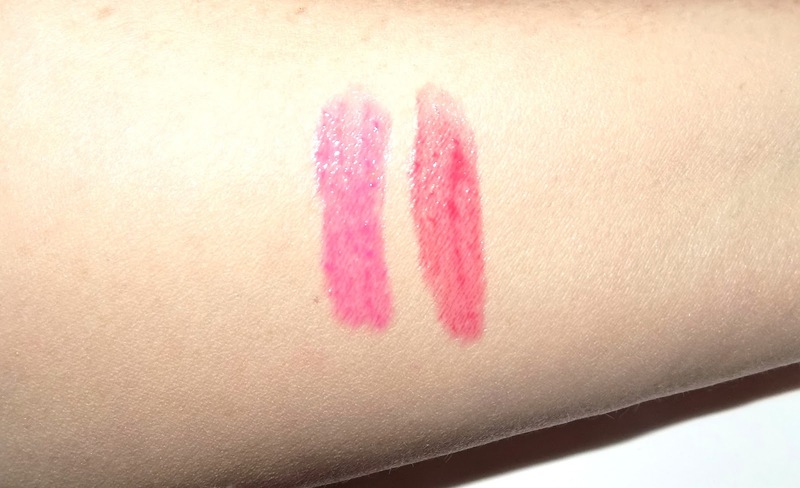 Shown are Modern Pink and Pop Poppy , two of six shades. A large round barrel brush is a must when drying my hair. The larger barrel gives a great blow out for my long, thick hair . The Body and Bounce one from Goody's Amp It Up line has been a great discovery. I had been using an even larger sized one from a more expensive brand but it didn't end up having as good a thermal barrel . This has worked to give my hair much more curl , volume and smoothing while the barrel's heat helps hold the style in place. The nylon bristles on the 1 1/2 inch brush have been easy on my hair and I haven't had any tangling. Results you'd expect from an expensive brush at a lower price . 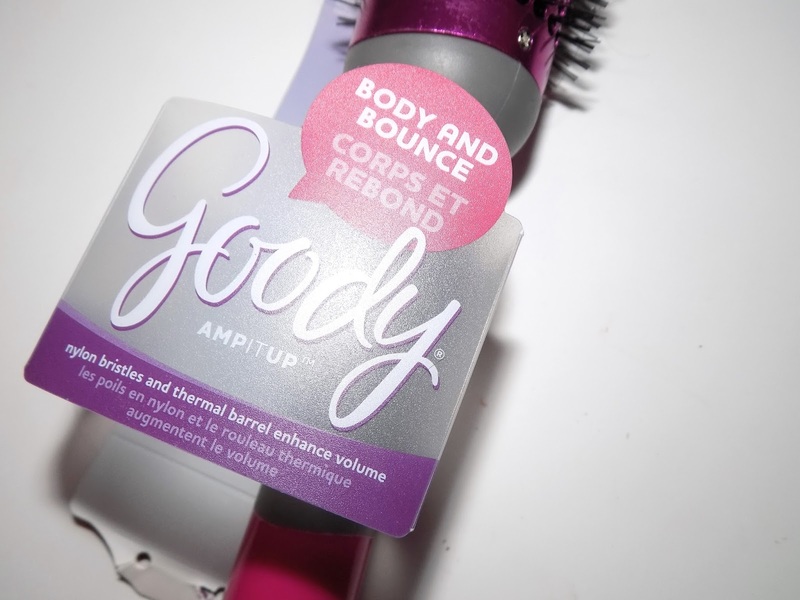 I don't have exact retail for this but you can find Goody at Target, Wal Mart, and drugstores. Setting Mists are one of things that I often skip and when I do use one I always think why haven't I been doing this more often? You don't know how good they are until you use one . 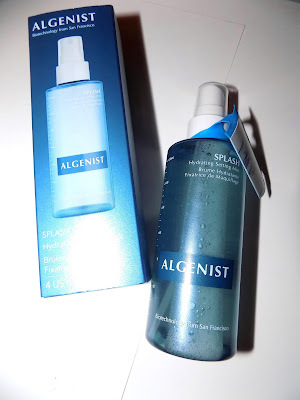 New from one of my fav skincare brands, Algenist, is Splash Hydrating Setting Mist using sea water and fruit extracts like watermelon and apple. 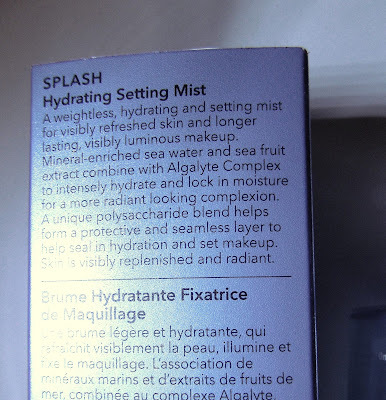 The hydrating part of the name scared me a bit, I like a little extra moisture but nothing that will make me oily or overly dewy. At the same time my skin is a little drier in Winter and I want to avoid any makeup caked spots. No worries here as this is a light mist that feels fabulous on. It adds a touch of moisture with a cool , soothing feeling on skin. It sets right away , sinking into skin with a subtle watery floral scent. It definitely helps to take away any of that cakiness that comes along with drier Winter skin and sets makeup too, for better all day wear. 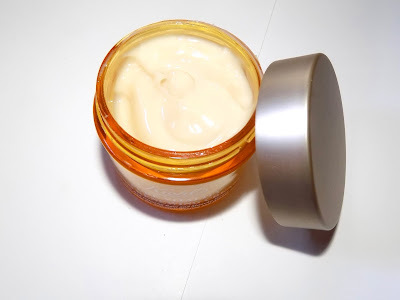 It can be used on bare skin and re-applied during the day. Since it feels refreshing I'll be spraying it a couple times a day. Busy days or 50 mph winds like we're supposed to have tomorrow make this a keeper deskside. 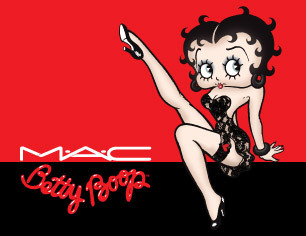 In time for Valentine's comes MAC x Betty Boop. 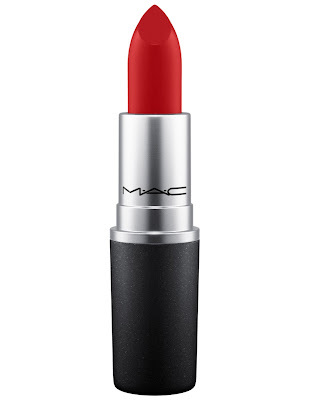 This new lippie is a perfect true red, just like Betty's iconic look. 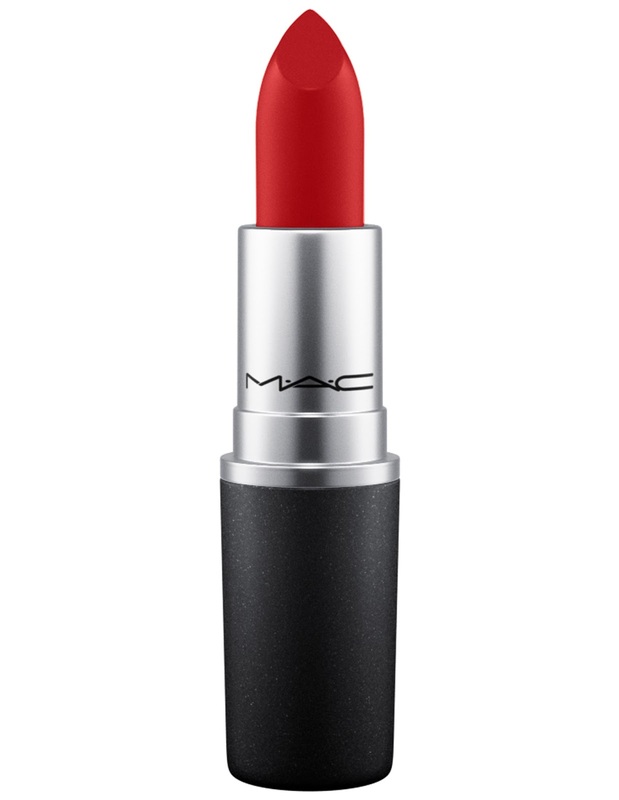 Betty Boop™ Red is available online only on Feb. 14th . One of the hardest things with my makeup , is how fast it melts, smudges or wears off on me. With mascara I never get the lash look I really want because there are only truly a few mascaras that actually stay on my eyes all day. Even most waterproof versions run or smudge within a few hours. 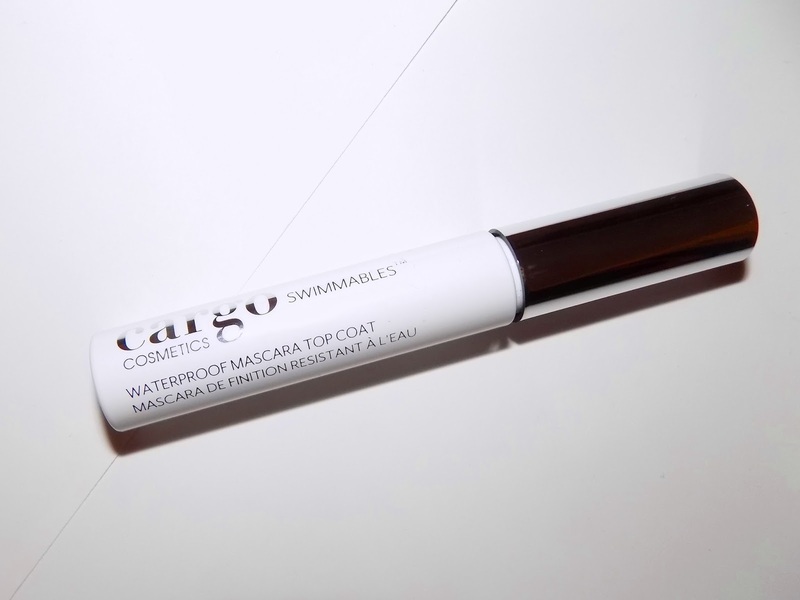 So when this new waterproofing top coat came from Cargo , I was game to try it. I had at least 2 new giant lash mascara formulas I hadn't been able to wear that were perfect for testing. It worked. I will admit I was surprised. I can smudge anything you put near my eyes. At about 3 PM I did have a small amount of run, barely anything but it was a little. I quick tissue wipe took care of that and the rest of the night it was fine. It also didn't run down when in the shower but lightly wore off and I still needed some eye makeup remover to get all my mascara off. This top coat is a clear, lightweight and sort of gel like . Once you apply regular mascara, wait until it's almost dry, then apply the top coat and let set for a few seconds. I went over my lashes twice with the top coat, I wasn't taking any chances on raccoon eyes. It doesn't seem to affect mascara much. Lashes don't feel drier or tacky nor does it add weight or pull at them. It did make a couple lashes stick together a bit but I did use two coats and that could be why. You can also touch up with this midday if needed. Cargo has made a name with their Swimmables waterproof , wear in the pool, beach etc products and this is a great addition to the line. 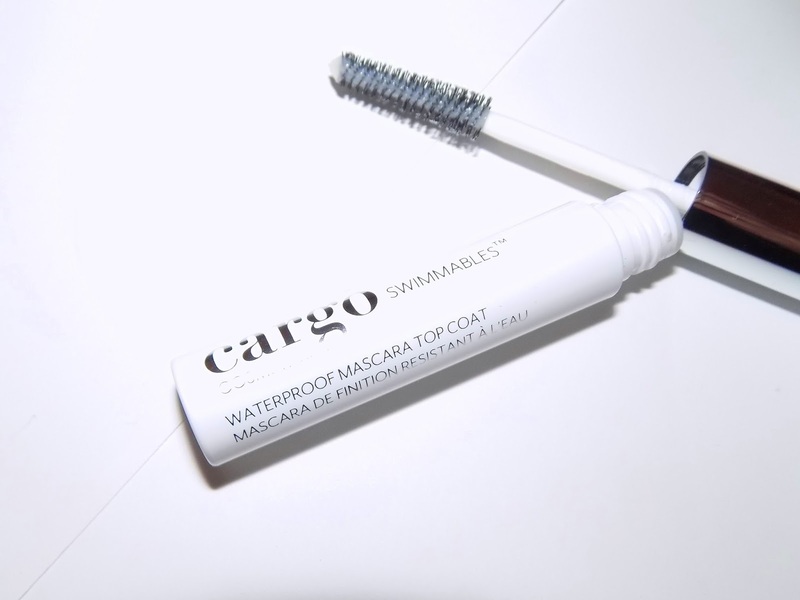 Cargo Cosmetics Swimmables Waterproof Mascara Top Coat is $ 22 and is available this Spring at Kohls, CargoCosmetics.com and Ulta. 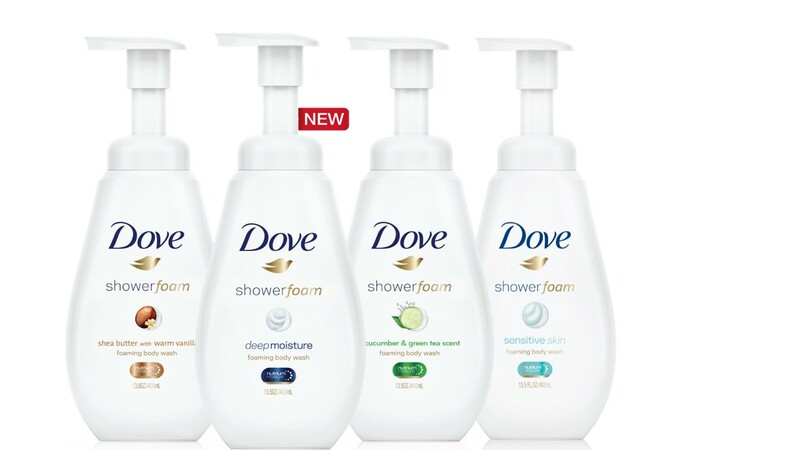 Dove fans, there's something new in town, Shower Foam. 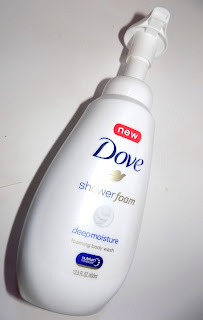 I love Dove's Nutrium Body Wash and use them all year long. This Winter it's been the newer Dry Oil version that's keeping my skin well hydrated in the chilly temps . I tend to skip lotion more often than I should, so that added moisture is a big help. New Shower Foam comes in a pump bottle and is a light, foaming wash. It has Nutrium Moisture of course but will appeal to those who like something a little a lighter in their shower products but still want moisture. It comes out of the pump a thin foam that lathers up well. 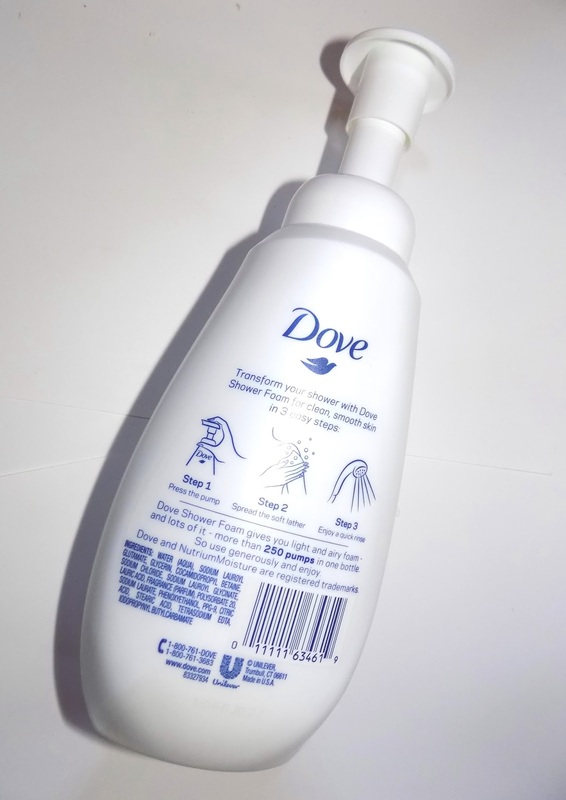 You'll need a few pumps each use but Dove says that it has 250 pumps in each ( 13.5 oz) bottle. Shower Foam comes on four versions. Deep Moisture, shown, Sensitive, Cucumber and Green Tea and Shea Butter Warm Vanilla. 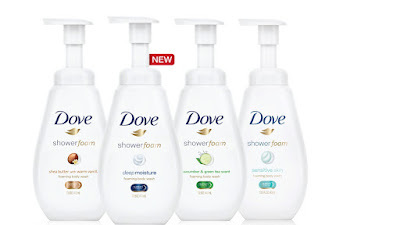 Dove Shower Foam retail varies but it's 5.99 @Target and 7.79 @Walgreens currently. 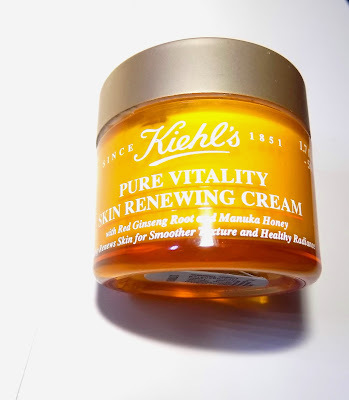 Honey, known for it's healing properties and is said to be anti-bacterial, anti inflammatory and good for wounds, is the key ingredient in Kiehl's new Pure Vitality skin cream. Manuka honey is a special, super charged ( if labeled with a high UMF) variety from New Zealand. Having a friend there I've had the chance to try it many years ago and loved adding it to tea. It's rich and thick. Pure Vitality truly feels honey based as it does have a sticky, tacky feel on skin and the the scent is honey herbal . 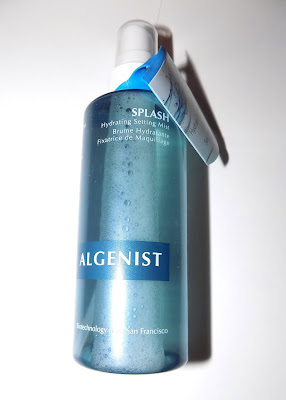 I noticed after using this just once overnight that my skin looked more plumped. Not bad for a quick test as most things don't work that quickly. I've only used it for a few days so I can't say what it might do long term but it's nicely moisturizing and soothing to skin but not too heavy. A little goes a long way too, you don't need a lot. This will be a boost for drier skins , and even more so those who are sensitive and dry . I've taken to rubbing into the back of my very dry hands as well. Pure Vitality is 99.6 % naturally derived. Red Ginseng root is another key ingredient and shea butter, beeswax and glycerin are in there too. 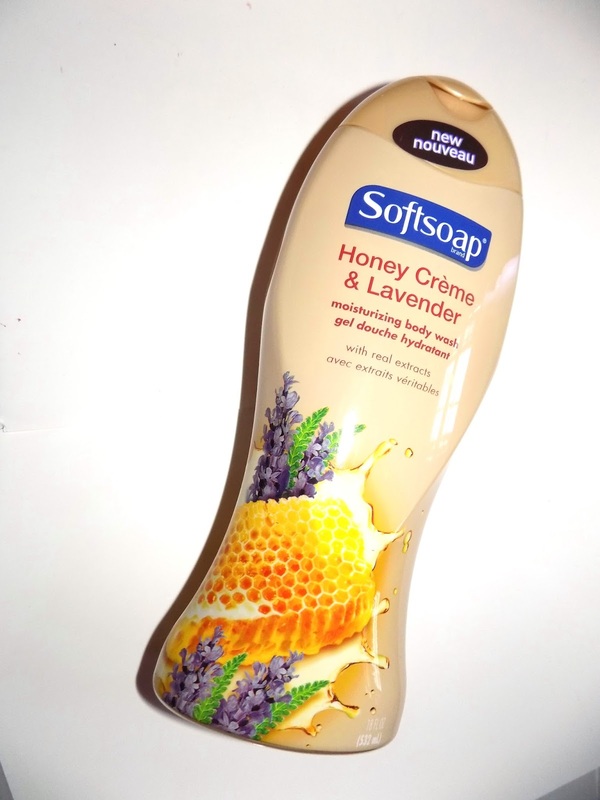 In time to scent the way into Spring while still keeping Winter skin clean and hydrated are two new releases from Softsoap. Honey Creme Lavender is a very soft soothing fragrance of cool lavender mixed lightly with honey. It's a nice way to wind up a chilly night or add a calming start to the morning. 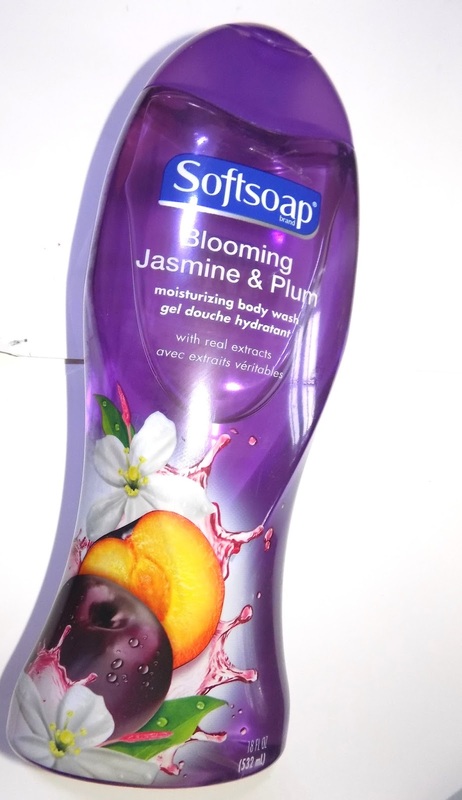 Blooming Jasmine and Plum ( my favorite of the two) is a burst of fruit with lots of plum and just enough floral to make this feel like Spring in a bottle. Both are nicely moisturizing while not being heavy and both also have extracts of their signature scent listed in the ingredients. 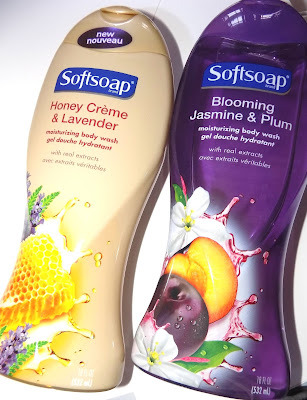 Softsoap Blooming Jasmine & Plum and Honey Creme & Lavender Body Washes are $ 2.97 and available now. Oddly I've never tried L'Oreal's Infallible Pro Matte foundation, especially since I am a matte fan but I am loving the new Infallible Total Cover foundation . I like a full coverage foundation and this delivers. 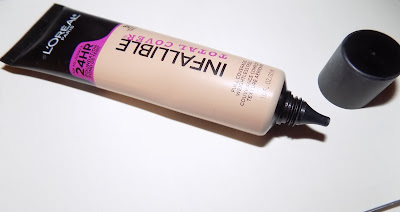 It covers almost everything , I needed just a dab of concealer under the eyes . It's a satin formula, best I can describe it. It's not matte or dewy , feels lightweight on and doesn't cake or set into lines and easily is as good as many high end foundations I use. This is a thick formula and you need to squeeze to get some out of the tube. It also sets fast so skin needs to be well prepped so you have some slip to blend it out with. Once set, skin looks perfected, smooth and covered but not heavily made up. I used my fingers to apply, but a blender sponge ( and L'Oreal has their own new ones out) will work well. 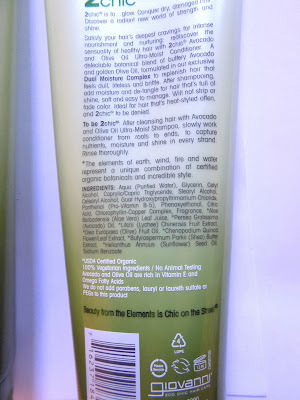 I get long wear with this as promised except in my oily T Zone. The rest of my face still looked good by end of day at 5PM and even further into the evening it was still holding up. There was oil breakthrough on my nose within a couple hours and my chin by lunchtime. My skin does seem to be in extra oil mode right now. So I needed more than just a sheer powder and used a powder foundation to get it reset. You can according to product information use this for body makeup as well. I didn't try that but it seems to cover well enough that it may work for that. 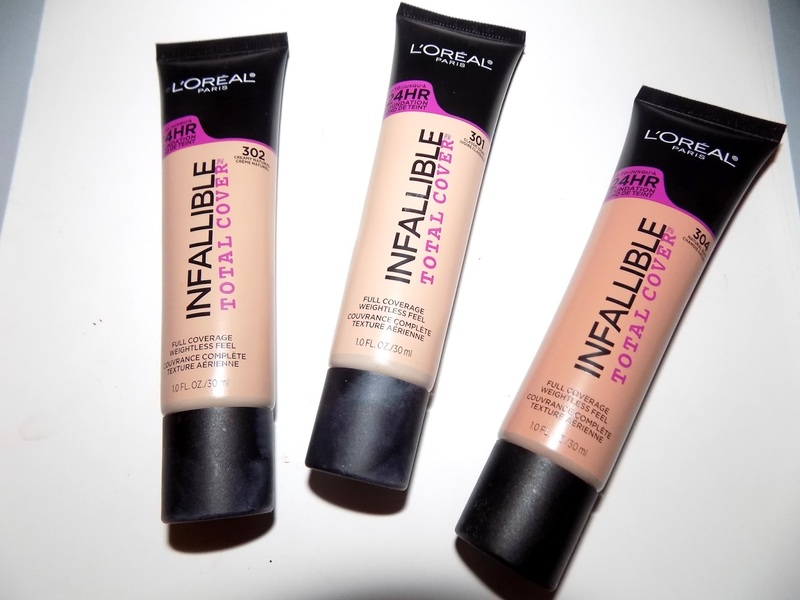 L'Oreal Infallible Total Cover Foundation is $ 12.99 and comes in 12 shades .